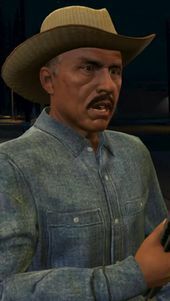 Manuel is a character in the HD Universe who appears as a Strangers and Freaks character in Grand Theft Auto V. He is voiced by Jay Santiago. Manuel is, in 2013, a resident of Blaine County who is 'arrested' by Trevor Philips, Joe and Josef, as Joe and Josef believe he is an illegal immigrant. After forcing him, at gun point, into their vehicle they throw his papers out the window. They then capture two more 'illegal immigrants' from a concrete factory before Joe and Josef take them to a local police station to allow the police to investigate their immigration status. Manuel is later released by the police and meets Trevor in Paleto Bay. He explains that he can not be deported as his family have lived in the United States for over two hundred years, making him more American than Trevor. After a brief argument, with Trevor holding a gun against his head, he tells Trevor to kill Joe and Josef but that he will not pay him as Trevor owes his family a debt following his involvement in his 'arrest'. Trevor then leaves and drives the short distance to where the two are located, and kills them. This page was last modified on 2 November 2013, at 00:46.